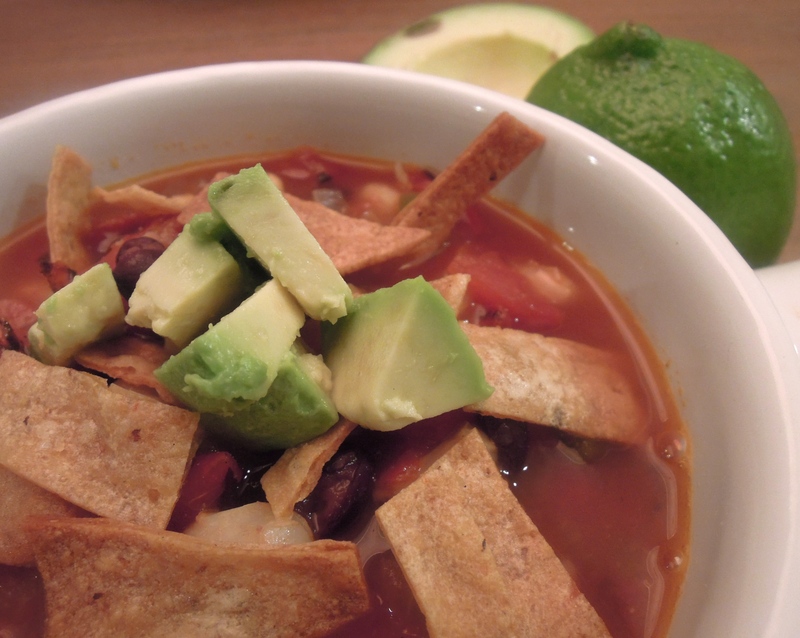 Tortilla soup is one of those foods I’m absolutely crazy about. My love for tortilla soup was ignited on our trip to Cabo earlier this year. I ate it every single day. 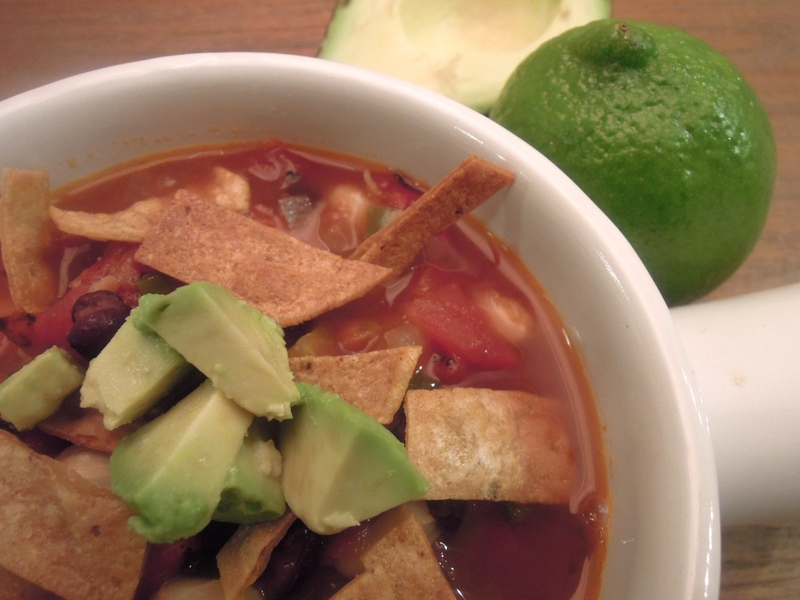 Although the resort had some fabulous restaurants, I was perfectly happy with a giant bowl of tortilla soup for dinner each night topped with plenty of crunchy tortilla chips and avocado chunks. I also recently remembered that I ate tortilla soup the day we got engaged so of course this love affair was meant to be. As much as I adore tortilla soup, I’m really picky about it, too. It can’t be too creamy. It can’t be too broth-y either. It has to have just the right balance of tomato-y broth with a slow-burn heat plus delicious ingredients like black beans and hominy. Speaking of which, have you tried hominy before? It’s soooo good. Hominy are dried and soaked corn kernels (you buy them already like that, usually in a can, and drain and rinse them like you would beans). It lends a perfect chewy texture and very subtle flavor. You can find it in the Spanish/Latin foods section at your supermarket. I’m happy to say this is the closest I’ve come to a tortilla soup that tastes like the endless bowls I had in Cabo. I hope you love it, too. And, as promised, this is another meat-free recipe to help keep things balanced around here. Preheat oven to 475 degrees. Stack tortillas and slice into thin strips. Pour a thin layer of olive oil on a baking sheet. Add tortilla strips, toss with olive oil, and arrange in a single layer. Bake 8-10 minutes until crispy like tortilla chips. Season with salt while still hot. At the same time, place whole poblano pepper on top rack of oven. Cook about 5 minutes until warmed through. Once cool enough to handle, remove seeds and ribs and chop. In a soup pot, heat olive oil over medium-high heat. Add onion, garlic, jalapeno, and poblano. Saute until onion softens, about 10 minutes. Add cumin and cook about 30 seconds. Pour in vegetable stock, tomatoes, hominy, and beans. Bring to a boil. Reduce heat and simmer 15-20 minutes until slightly thickened. To serve: Spread a layer of cooked tortilla strips on bottom of bowl. Add soup. Let sit 1-2 minutes until chips soften. Top with more tortilla strips, avocado chunks, and chopped cilantro. This entry was posted in Soup, Stew, Vegetables on November 18, 2013 by Paige Greenfield.